Following the respray, I had to paint the anti-glare panel. 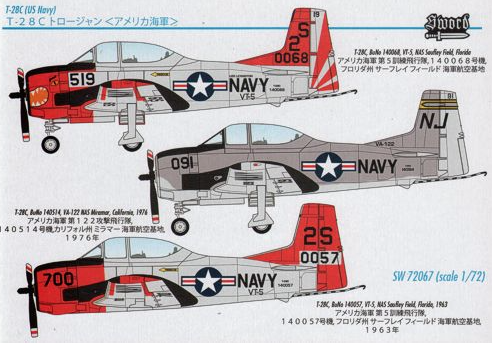 I then tackled the decals. I had bought a decal set from Caracal Models which gave 5 US Navy markings for Goshawks. 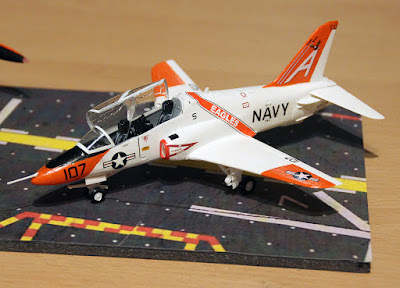 I picked the VT-7 set - Eagles as I liked the name down the fuselage. The decals went on very well. I had a bit of dif culty with the big stripe. It would match at the join in the fuselage - which left the other ends in the wrong place - or get the ends right which left a problem at the middle. I opted for getting the middle right and then cut out extra bit from the VT-(Tigers) set to ll in the gaps down at the wing roots. Unlike the kit decals, the Caracal set had all of the serials, etc. which I needed as the Buckeye was similarly decalled. After fitting the decals, I then added all the other bits that I had left off such as the pitot tube on the nose, the arrestor hook and the undercarriage. This is where I found the only problem with the kit in that there were not clear instructions for how the undercarriage doors were to be tted to the undercarriage legs. I tried looking up images on Google but, although there are lots of lovely photos, no one seems to have just shot the undercarriage! Never mind, because the doors will not really be seen once the aircraft is on its proper feet. Here is the finished article. Here is the Goshawk alongside the Buckeye. They make a nice pair.